Irrespective of the religion we follow, God is the same for all of us. 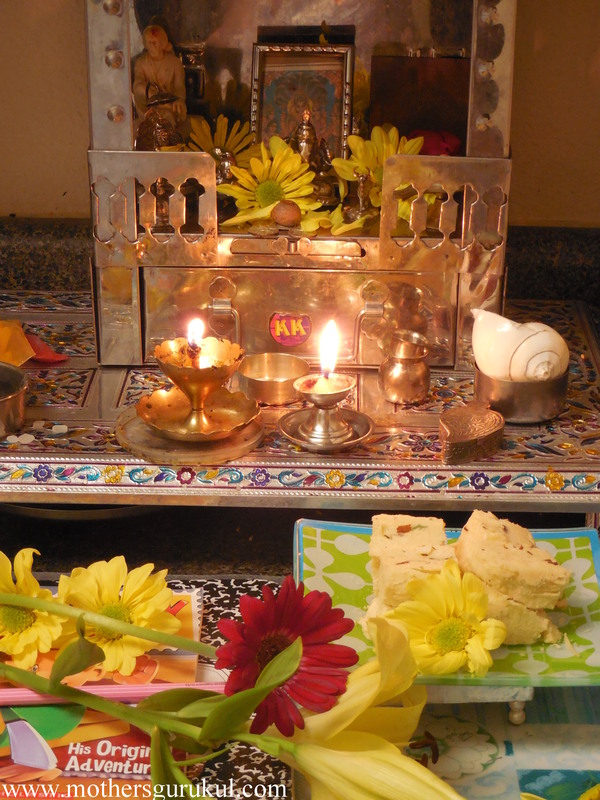 In most households, it’s a family practice of performing prayers in the mornings or afternoon or evening. When we go to the temple and we hear bells or Aarti words, we automatically join the crowd and start singing it. That’s the charm of prayers. They have the power to make the atmosphere around us calm & full of divinity. Teaching kids to pray can start even before they can speak meaningful sentences. Allow them to see you praying and also invite them to pray with you. Children learn the importance of prayers by hearing their parents or elders pray. I have been in the USA for the last 10 years. After our daughter was born and when she started understanding things at her level, we made a discipline to visit temple once a week. We fixed a day and followed that schedule. That way she knows that today is temple day. Young kids will not stand at one place and say the prayers but they know it. As with any good habit, you’ll want to start reinforcing prayer as a regular part of life as early as possible. Once a child can communicate verbally, you can move on to some short shlokas (verses). Make sure that the children understand what they are chanting. Why do we pray? To start our day fresh with positivity. How should we pray? Praying together is a healthy family practice. It binds the family together. Let them sit with you. Explain them as you perform your daily Pooja (prayers). You can tell them in simple words like now we are giving bath to gods, gods too feel hungry and thirsty so we offer Prasad and water. When they start sitting with you, that’s the time to introduce small shlokas to this practice. When to start? It is never too late to start any good thing. But there are few practices that if started at an early age, are adapted more easily. Especially, when we are upbringing our kids outside India, starting early become quite important and the adaptability becomes smooth and welcoming. Giving our phones to kids just because they don’t want to stay inside but we want them to. By giving them this option aren’t we are indirectly telling them that it’s okay to be on phone and it’s not that important even if they don’t want to be a part of the prayers. Else, try to prepare them before leaving for the temple. Explain them that every place has its decorum, importance and we have to follow that. Tell them that if they will be playing then what’s the point of coming to the temple? Initially, they will be bored as they don’t know the prayers/verses but slowly they will get it. 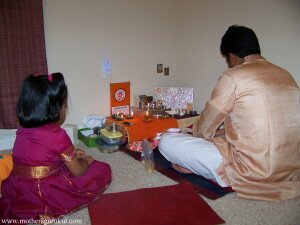 You can’t expect very young kids to stay calm during the aarti as the sound is quite loud for them. At that time, it won’t be a bad idea to step out of the hall for a while. These were my thoughts about the importance of prayers. I have shared what we have been following so far. According to me, we can easily find some time out of our routine to spend few minutes for prayers. It’s just a matter of setting a routine and following it. Very soon you will see that you don’t have to remind your kids. Pray in their presence. If we make it a habit then they will automatically follow it. I am Alpana Deo – wife, mom & the person behind www.mothersgurukul.com. After finishing up my studies & then working in India for sometime, I came to the USA 9 years ago. During this span, I got to know American culture very closely. With a desire to stay connected to my educational background & hobby of writing, I put together my website ‘Mothers Gurukul’ – a place not only for moms but for all the parents who are trying to raise their kids in two very rich but totally different cultures. Join me on my journey.